I finally had a weekend to address my ADD -- that's Art Deprivation Disorder. Friday night, I went to the newest Austin warm glass shop, Helios, to see a slide show by wildlife artist Kathleen Sheard, who calls her work micromosaic. 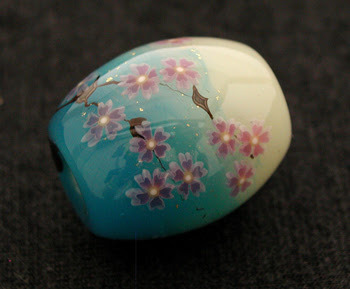 Some of her incredible pieces involve 50 passes through the kiln. Beautiful! 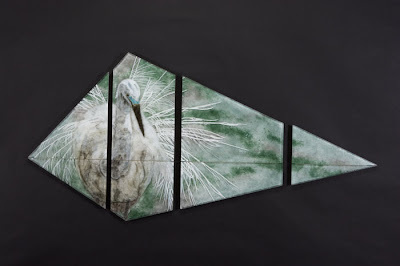 This egret is 8 pieces and 4' x 7'! Saturday I started the ADD rounds in my various media. I spent time before yoga stitching on Assunder, a Matrix quilt started more than a year ago and left in limbo because of being overwhelmed by the amount of stitching needed to get it to my taste. Then I fired my precious metal clay pieces (PMC) for assembly later. I finished painting a new group of glass tiles and fired those, as well. I cleaned up in the glass studio during all that kiln time (I didn't want to trip the electrical breaker by turning on the oxygen concentrator and another kiln). Finally, I was able to get on the torch and make a few beads, refamiliarizing myself with the technique for wrapping glass tiles around a base bead. On Sunday, I was back out at the kiln at 7 am to get the PMC assembly fired before my yoga class. Then, back on the torch, I wrapped a few more glass tiles and made some beads intended for electroforming experiments. I also painted the cicada wing with copper paint, readying it for electroforming. Whew! No wonder I couldn't sleep last night. Too many ideas were bouncing around in my head! 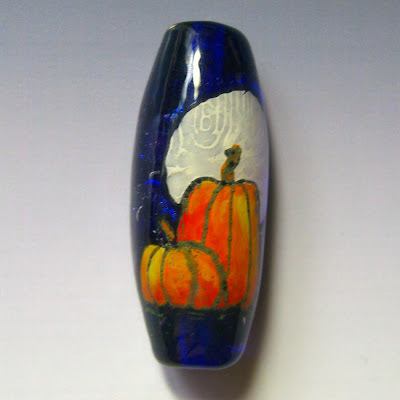 I love the pumpkin beads!! Wonderful beads; wonderful artist. These are lovely. 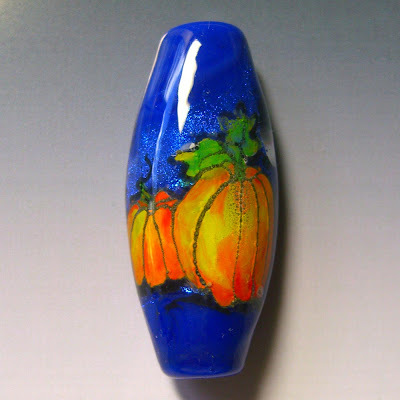 What kind of enamel painting kit would you recommend for lampwork glass beads? 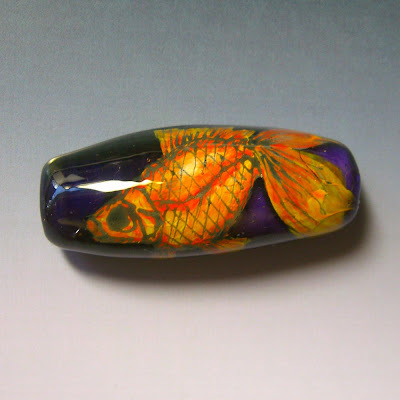 I currently have Thompson Enamels for glass. Heather, it depends entirely what you want to do. These are using the methods taught by Bronwen Heilman. You can get details in her book.